Our excellent jewelry design Q&As will have you beading up a storm and mastering your creative skills in no time! Necklace and bracelet sizing charts, figuring out necklace and anklet lengths and more! 1. How do I decide on the length for my chain necklace? This length usually falls just above the collarbone, which displays a necklace beautifully on your neck. This length is the most popular and is ideal for most women. Princess length can be easily dressed up or down. Its versatility accommodates many different styles of beads and techniques. Like the princess length, the matinee is a popular, classic choice. It’s an ideal length for a necklace worn over clothing or with a low-cut top. A long, opera-length necklace offers many jewelry options. Wear it as a single strand, or double it as a choker-length necklace. Depending on the beads, this length might also work as a bracelet when wrapped multiple times. This length hangs extremely low, sometimes just above the waistline. With such a length, you can make a multi-strand necklace or bracelet when wrapped multiple times. 2. What is an appropriate length for a bracelet? An average bracelet length is about 7-8 inches including the clasp. 3. What is an appropriate length for an anklet made with chain? An average anklet length is about 9 inches including the clasp. 4. I've finished my jewelry and I've made the length too short, what can I do to make it longer without taking it apart? You can add an extender chain to your jewelry to lengthen it. With an open jump ring attach an additional piece of open cable chain to one end of your jewelry, if you are not using a lobster claw clasp or a spring ring clasp on the other end; you can switch the clasp out and connect the new one (lobster claw or spring ring clasp) with an open jump ring. After this is done you can connect the clasp to the desired length of extender chain in the back. When constructing a chain necklace or bracelet you can avoid having this trouble by making sure that one end of the chain is longer than the other to use for the extender part of your jewelry. Another way extender chains are used is by adding chain to both ends of your piece. If you have a piece that is too short add the same length of chain to both ends using jump rings. To finish, add any clasp you choose for the ends of the extender chain. 5. The clasp on my chain necklace keeps sliding toward the front. How do I prevent this from happening? If a clasp is too heavy for a necklace, gravity may cause it to slide forward. As a general rule, the clasp should be lighter than the necklace. When using chain, a possible cause is that the beads or components are not attached directly to the chain links. If the chain is strung through the beads or components in your necklace, they will tend to slide around, making it easier for the clasp to shift also. If all the pieces in a necklace are secured to the chain links, the clasp will stay in back. Another way to prevent this is to add a bead to a small piece of chain that you can hang from your clasp. The bead with chain will hang down the back of your neck weighing down the clasp so it won't slide forward. 6. How many beads do I need to make a wire wrapped necklace? 7. 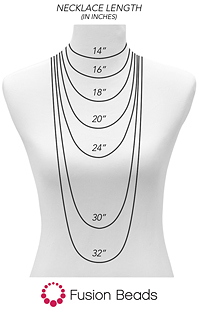 Click here for a helpful necklace sizing chart. 8. Click here for a helpful bracelet sizing chart.